When we look at the final 2016 Crime Statistics, the Murder down 4.8%,Shootings down 12.3%,Robberies down 8.7%,Burglaries down 14.6%,Crime in NYC Subways 3.5%, Overall crime down 4.1%. As given more details ; the number of murders dropped to 335, compared to 352 in 2015 and there were 101,60 crimes reported in New York City, a 4.1 percent decrease from 2015, which saw 105,921 crimes reported. Many officials made remarks during the press conferences.Here are some highlights: "It wasn’t an accident how it is that crime plummeted in NYC over the past two decades and continues to do so.Over the last year and a half, we’ve expanded our Neighborhood Policing Plan which is a crime-fighting model of policing. Precision Policing: The Neighborhood Coordination Officers working w/the greatest detectives in the world to keep NYC safe" said NYPD Commissioner James P. O'Neill. Police Commissioner James O'Neill also stated that A delegation from Chicago came to NYPD to learn about its strategies since Chicagi had 3550 shootings last year. "I want to just offer my congratulations to the Commissioner Jimmy O’Neill, to all of the men and women of the NYPD and to all of the community partners. 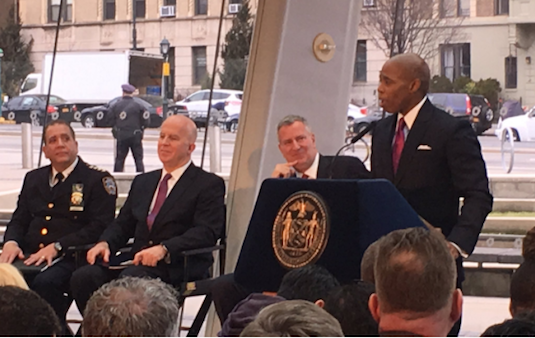 This is an amazing moment for New York City. The fewest ever shootings in New York City – the first time we have been below a thousand shootings in the modern era for a single year in this city, absolutely amazing. What Commissioner O’Neill has set in place with neighborhood policing is still in its infancy. We expect great things and as it spreads more and more throughout the city we expect that relationship between police and the community to deepen further." Brooklyn Borough President Adams also praised four crime drop 4% and Brooklyn Museum was chosen as the spot because that borough had the biggest drop in crime.
" We didnt just break the record on the low number of shootings in NYC ,we shattered it" said Deputy Commissioner of Operation Dermot Shea. "The NCO(Neighborhood Coordination Officers) program has been a key component for us. We use those officers out in the street to get us information. They bring us back motives, bring us back evidence so we can act as a force multiplier to our detectives." said Chief of Detectives Robert Boyce. 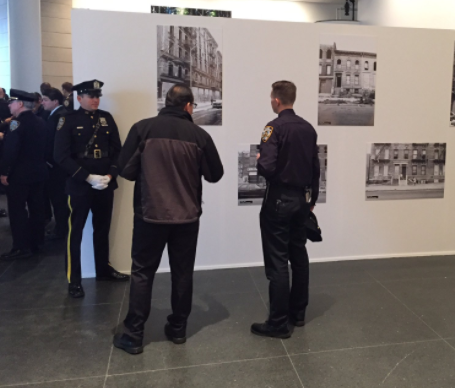 Many Local Elected Officials and Community Leaders attended the exhibit and press conference in Brooklyn and received a very positive feedback on how NYC is getting much safer every year.